Massive wildfires raging in drought-stricken southern Chile have wiped out hundreds of plant species, and are now threatening animal life as well, officials warned. "We are witnessing a massive environmental catastrophe" in southern Chile, Accion Ecologica chief Luis Mariano Rendon told AFP from Mexico. "There have been whole species lost, such as the Araucaria araucana (monkey puzzle tree). They are trees that take hundreds of years to reach maturity. So this is a practically irreparable loss for current generations." The trees, a distant relative of better known pine, are considered sacred by indigenous Mapuche people. And Chile itself has declared them part of its unique national natural heritage. 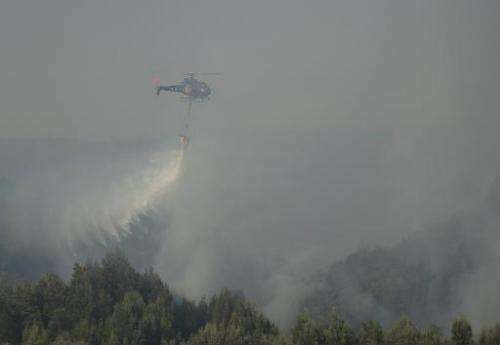 Fires advancing for several days in the country's south have ravaged more than 3,700 hectares (9,100 acres) of forest, and have been contained but not put out entirely, firefighters said. There are still 25 active fires, affecting 11,428 hectares of trees and brush, according to the national emergency office ONEMI. Conguillio National Park lost 70 hectares of preserve area, but the fire there was contained by late Saturday, National Forest Board officials said. "Since we are talking about protected areas that have been lost, this really is something that has an impact for all of mankind, due to the invaluable nature of ecosystems," said Rendon. Forest fires are part of every southern hemisphere summer season in Chile. But for Rendon, "it is just embarrassing that Chile (Latin America's wealthiest country) should be so totally defenseless." "We have plenty of F-16 fighter jets, but we don't have enough smokejumpers and repellers," he said, referring to aerial firefighting equipment. Argentina—Chile's neigbor across the Andes—is sending a team of 30 wildfire control experts, according to ONEMI.